It’s National Puppy Day! Do You Need a Dog Fence? There are so many dog-friendly fence options! March 23rd is National Puppy Day! If you have a puppy, you know the importance of letting your furry companion outside to run and play. However, an unwatched puppy can soon become a lost puppy. What’s a good way to ensure your puppy’s safety even when you aren’t watching? By building a dog fence, of course! However, some fences work better for dogs than others. Here’s a guide to choosing the right fence for your best friend. Chain link fencing is an ideal fence for dogs because it’s affordable, easy to maintain, and it easily contains your pooch. However, the visibility provided by chain link fences does pose a problem with some dogs. Especially curious pups may bark at other dogs or animals they can see on the other side of the fence, which can be frustrating for neighbors. Your dog may even attempt to dig a hole to escape underneath the fence. Luckily, there are ways around this predicament. Inserting vinyl fence slats makes your dog fence look nice as well as blocks the view from inside the fence. Some carefully planted landscaping around your fence is another way to block the view and dissuade your dog from digging. 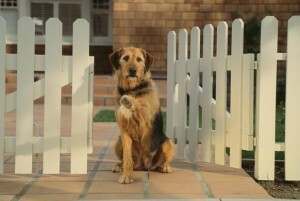 A solid wood fence is another great dog fence option. Unlike the chain link fence, a wood fence doesn’t provide a tempting view to your puppy. However, a wood fence is more maintenance-intensive than a chain link fence, which is maintenance-free. Wrought iron fencing is a strong fence that is great for big dogs. It also adds an elegant aesthetic appeal to your property. However, before deciding on your wrought iron fence, make sure that the fence will be tall enough to dissuade jumping or climbing over the top, and make sure that the spaces inside the fence will be small enough to prevent your dog from trying to squeeze through and getting stuck. This entry was posted on Wednesday, March 23rd, 2016 at 10:07 pm. Both comments and pings are currently closed.